The Polytron® 8100 EC is Drager's top of the line explosion proof transmitter for the detection of toxic gases or oxygen. It uses a high performance plug and play electrochemical DragerSensor® to detect a specific gas. Besides a 3 wire 4 to 20 mA analogue output with relays, it also offers Modbus and Fieldbus protocol making it compatible with most control systems. With unique electrochemical DragerSensors, Polytron 8100 can detect over 100 toxic gases and oxygen. These long life sensors provide continuous detection even under the harshest conditions. DragerSensors offer the industry's widest temperature and humidity range between -40°C to +65°C (-40°F to +150°F). The built-in memory contains all calibration and configuration information: therefore the sensor ships pre calibrated and is ready for immediate operation. An intelligent sensor self-test function allows for predictive maintenance. The intrinsically safe connection of the sensor eliminates the need for a flame arrestor, giving you faster response times and higher sensitivity. 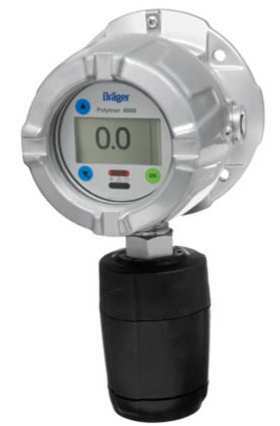 The Drager Polytron 8100 is equipped with digital interfaces allowing for quick and easy remote interrogation of the transmitter's state. Integration with existing asset management systems such as PACTware™ is possible via DTM. In addition to the common HART® communication system, the fieldbus interfaces with PROFIBUS® PA, FOUNDATION fieldbus™ H1, and Modbus RTU are also available. The Drager Polytron 8100 belongs to the Polytron 8000 series. All transmitters in this series have the same design and user interface. This allows for uniform operation with reduced training and maintenance requirements. The large graphic backlit display shows status information clearly and in an easy to use format. The measured gas concentration, selected gas type, and measuring unit are displayed during normal operation. Colored LEDs (green, yellow and red) provide additional alarm and status information. The Polytron 8100 is operated by means of a magnetic wand over contact surfaces. Upon request, the Drager Polytron 8100 can also be supplied with three integrated relays. This enables you to use it as an independent gas detection system with two arbitrarily adjustable concentration alarms and one fault alarm. Audio alarms, signal lights or similar devices can thus be controlled locally without an additional cable between the transmitter and central controller. Polytron 8100 features a Class I, Div. 1 rated explosion proof enclosure made from aluminium or stainless steel, making it suitable for a wide range of environmental conditions. A protection type "e" version includes a convenient docking station which allows installation in hazardous atmospheres without running conduit (where approved). The optional remote sensor enclosure enables the sensor to be installed away from the transmitter. This makes it easy to place the sensor close to a potential gas cloud in an inaccessible location while keeping the display at eye level. Because the sensor is connected to the transmitter through an intrinsically safe port, this eliminates the need to run conduit for mounting a remote sensor. And to make things even easier, Drager includes cabling up to 100 feet (30 metres) long. The intrinsically safe connection also allows 'hot swaps' of the sensor in a hazardous atmosphere without removing power or declassifying the area. With different software dongles, additional functions can be added to the Polytron 8100. The data logger dongle comes as standard and continuously records gas readings and events. A sensor test dongle is available for additional sensor self-test functionality. A third dongle is available for advanced sensor diagnosis. These dongles indicate the sensor's vitality, giving you an estimate of the sensor's remaining service life.